I got a heads up from Stephanie Ciccarelli at Voices.com – for anyone in the London, ON Canada area, there will be a PodCamp London on April 25th, 2009. With almost half a million people living there and the University of Western Ontario smack dab in the middle of town, I think this will be a pretty popular podcamp. It’s under a three hour drive from Buffalo and just a little over 2 hours from Toronto and Detroit so there’s plenty of reasons to check it out, learn some cool stuff and network with some fun folks. Proving that marketing an upcoming Podcamp at a Podcamp is not a bad idea, I wanted to let my readers in Ohio know that Podcamp Ohio 2 is coming up on June 29, 2009 in Columbus. I was in Columbus about a year ago and I want to tell you it’s a very nice area. I hope you are able to go. 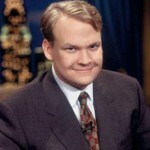 Andy Richter will rejoin Conan O’Brien when Conan begins hosting The Tonight Show on June 1st. Here’s the release from NBC. 1. This is a great move because the two of them had such great chemistry on Late Night with Conan O’Brien before Andy left to try other things. Joel Goddard was a terrific announcer for Conan and as Conan noted Joel would do anything the writers asked him to do (some very odd stuff I probably wouldn’t have had the courage/desire to do) but I think Conan recognizes there is a different vibe with the Tonight Show. 2. Yes, you are owed a podcast on results from the unofficial Late Night With Jimmy Fallon announcer auditions. It’s coming. Work is busy which is good for revenues and bad for podcasting. With a quick shout out to my new friend from Podcamp Toronto, Dave Delaney, I just wanted to let readers in and around the Nashville area know that Podcamp Nashville 2009 is set up for March 7, 2009. If you needed any more reason to come other than the learning and networking that’s likely to go on among those involved and wanting to be involved in Social Media….here’s another carrot for you: I won’t be there. See, now you HAVE to go. Podcamp Toronto was another great experience for me on Sunday although clearly Saturday was the day to go. The content was much stronger then, the turnout was much higher and I think the vibe would have been much less tired. Folks who attended on day 1 were beat by day 2 and you could tell. Look, Sunday wasn’t all badâ€¦there was some weird territorial drama unleashed at the wrap up session that clearly showed some folks were a bit frayed but these volunteers had worked very selflesslyâ€¦so those involved get a pass on that. As surprising as it was to watch, it was also intriguing. And yes I will go again next year. Podcamp is a unique eventâ€¦by now you’ve heard of its unconference structureâ€¦that has its pluses and minusesâ€¦mostly pluses. My overall challenge with Sunday’s content was that much of it was stuff I already knew. There wasn’t much take away I could say was a real “light bulb” moment for me. That’s the risk one takes in attending and I am cool with that. The reward is the “law of two feet” which allowed me (and everyone else) to walk into another session if I wasn’t happy with what I was learning at present. 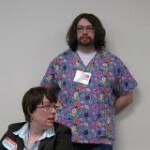 And to be fair, when I went to go to another session, that’s where enjoyed myself the most: the hallway conversations. So there were at least two sessions I never actually got to because of these great social media hallway hookupsâ€¦.which sounds a lot more prurient than was the case. Meeting old friends like Leesa Barnes, Stephanie and David Ciccarelli and Julien Smith as I walked the halls at Ryerson was great fun. Making new friends like Bernard Hellen of Traffic Marketing + Design, Dave Delaney (whose company â€“ Griffin Technology – donated a couple of prizes that I was awarded for a Podcamp Toronto audio promo that I voiced and produced), Steve Saylor â€“ the Albino Podcaster, a woman named Ninja who was both nice and very well versed in Martial Artsâ€¦.and many more. The three standout IRL meetings for me were catching up with Dave Fleet, whose PR blog I have subscribed to for a long time â€“ he was very gracious to introduce himself to me, thanks Dave. Sean McGaughey who has coordinated the audio promos among many of his Podcamp Toronto duties was also so kind to seek me out and I was so pleased to get to spend some time with him- Sean, thank you very much. Finally, the individual who impressed me so much whom I had never met before was the gentleman who organized the Mentor’s Lounge. This was a place where people with expertise in a wide variety of areasâ€¦.podcasting, web design, etcâ€¦would sit with those folks who had questions and a connection would be made. Sunday I volunteered to Mentor anyone on the topic of audio production and podcasting as it had been requested. The guy who coordinated all this was named Tommy Vallier who is a WordPress Developer and New Media Strategist. He is also, in my opinion a pretty sharp leader and connector. As you might expect at an unconference, connection in a setting like the Mentor Lounge never ends up being as clear cut as you might think/hope. As a result, people could have just stood around uncomfortably, not knowing what to do. Tommy connected everybody and then stepped back and let the magic happen. He did it with a great attitude and a positive team spirit. 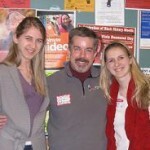 He made the Mentor Lounge. This was a highlight of Podcamp Toronto for me and I am thankful to Tommy and all the event organizers for their efforts in making Podcamp Toronto another wonderful experience for me.